Though personally I don’t expect Darvin Moon to look anything like Sammy Farha en route to 2nd place … you gotta love the debate going on over who will, and who should win … let alone whose victory would be “better for poker”. Super-young but true online pro vs. the “Ultimate Everyman” … you know, if everyman happened to cut trees for a living. “Are you crazy?”Â Matusow said, dismissively. The only difference this go-round, of course, is that the world has already been introduced to online poker, and the Sammy Farha pro character is being played by a 21-year-old who stands to be the youngest WSOP main event champ in history (for the second year in a row). The $2,500 Limit Holdem 6-max is down to the final three players, with Daniel Negreanu having a dominant chip lead. Brock Parker and Tommi Horkko are the other two left in the field. Finland now has its third top-3 finish in less than a week. You can still watch this final table at the Bluff website or for the international reader the PKR site. The $2,500 NL Holdemevent just got to heads-up with Keven Stammen holding a 2-1 chip lead over Angel Gullen. This looks to be a very fast final table as it took just 70 hands to go from ten players down to two. The $1,000 Ladies NL Holdem World Championship drew a field of 1,088 this afternoon. That figure is down from last year’s 1,190, which was lower than 2007’s 1,286 total. 370 ladies remain in the field when they return from dinner break, with Ulrika Tangstrom the reported chip leader at 30,000. Defending champion Svetlana Gromenkova is third in chips (22,200), other notables include Maria Ho (22,100) Anna Wroblewski (14,100) and and Pam Brunson (8,200). The Ladies’ field had at least one regular not in the field, as Barbara Enright ended a 23-year tradition of playing, as she was still in the field for the $1,500 Seven Card Stud event. The players made it into the money just before their dinner break, with 34 players currently remaining. Fabrice Soulier is the current leader with 120,000 in chips followed close behind by Dutch Boyd at 116,000. Defending champion Michael Rocco is 6th in chips at 75,000, with Enright listed in 7th in with 60,000. Other notables remaining include Thor Hansen (56,000), John Cernuto (40,000) and Pokerati blogger Robert Goldfarb (20,000. The players will now try to beat the 3am deadline to reach a final table, which does look like a possibility for this event. The $5,000 NL Holdem event has 65 players remaining, just two away from the money. Billy Kopp is the current chip leader at 350,000. Faraz Jaka is in 3rd place (334,000), with online phenoms Isaac Baron (326,000) and Mike Sowers (320,000) close behind. More experienced professionals Kathy Liebert (238,000) and Erik Seidel (225,000) are also in the chase. While Ivan Demidov hasn’t cashed at this year’s WSOP, his girlfriend Liya Gerasimova is on the cusp of doing just that with 215,000 in chips. The $10,000 Omaha 8 or Better World Championship brought a field of 179, including Sammy Farha, down 56 from last year. 30,000 in chips and a slow structure means low eliminations so far, but there’s bound to be a few when play ends today at the end of level 8. To catch the updates for all of these events, head to www.worldseriesofpoker.com to follow all the exciting tournament action. Pauly and I take the Tao of Pokerati studios remote — and set up shop in the Milwaukee’s Best Light Lounge to watch the chipstacks of a PLO/8 final table (on dinner break) as Eric Seidel goes for bracelet #9 (against Casey Kastle) in what may or may not be a record final table. While Phil Hellmuth has the decades left to stay ahead of the pack, Seidel stands a better chance than Doyle Brunson of catching him, chronologically at least. 5:30 — My view of Tom Schneider vs. Gavin Smith is blocked by the decorative Doric column cameras. Apparently the set designers aren’t aware that Caesar’s Palace harkens back to more of an Ionic era. 5:33 — Phil Hellmuth is all-in against arguably the weakest opponent in the field … he’s got aces, and the his opponent, Tom Dwan, aka online wunderkind “Durrr” has 10s. 5:36 — Ooh! Hellmuth on the turn! Hellmuth picks up a flush draw that doesn’t get there. Poker is fun! 5:39 — Hellmuth is talking about his brilliant show of weakness to get Durrr to push as they count up his chips … yep, they were even stacked and the greatest heads-up hold’em player in the world is out. 5:53 — Mike is doing his best impression of that Full Tilt commercial where he’s bluffing … and just got sucked out on and crippled by Hachem. Mike is waving an Australian flag. 5:54 — Jamie Gold’s mom, btw, is playing 1/3 in the cash room. I can’t see her chip stacks however. She looks to neither be killing the game nor getting killed. LAS VEGAS – Nope, you’re wrong. A six-handed final table is a…six-handed final table and Hoyt Corkins took it down. I’ve discussed my fantasy poker point system with LB at The Poker Biz, aka Wicked Chops Junior. None for me. Then he scolded me in front of everyone in the media room today for not reading your post. But hey, I’ve got money to lose. And thanks for the kudos but I have been eliminated from the limit $3k NLH event. My high pocket pairs were up against a higher pocket pair every time. Just down right cold decked. My table was less than exciting but all around me sat Joe Sebok, Amir Vahedi, Annie Duke, JC Tran, Phil Hellmuth, Eric Seidel and David Sklansky. FYI – This would typically be a comment; however, the comment feature is still unavailable. I’ve got a fun little speaking gig this weekend — visiting the Beth Torah men’s club to talk poker. Perhaps the best thing about the UIGEA will be the end to all those terrible PartyPoker ads (and that song!) on American TV … Check out these Full Tilt videos I just stumbled upon (via Bill Rini’s sitemeter), which tell you quite a bit about who online poker sites are marketing to these days. Do you play so much poker that your wife is probably banging other dudes? Phil Ivey feels your pain. Are you kinda socially awkward, a la John Juanda, but still fully entertained by great farting? And gay or not, Erik Seidel speaks to probably half the Batfaces in some capacity or another. The game became a worldwide obsession virtually overnight. Now what will become of the game? The future of poker arrived in 1984–when legendary Vegas gambler Bob Stupak faced off against Orac, a poker-playing Apple II computer. It was heads-up no-limit Hold ‘Em for $500,000, in a showdown that would later air on ABC’s Ripley’s Believe it or Not. At one point in this first-ever televised poker game, Orac had flopped a set, and Stupak, looking at top two pair, was raising into the stone-faced machine. As he was programmed to do, Orac put Stupak all-in. Stupak called, and that’s when the computer crashed. “It just froze,” recalls Mike Caro, “the mad genius of poker” who created Orac. According to the rules for this unusual match-up, even though the cards had already been turned over, the hand had to be replayed. Stupak would get a better deal after the machine re-booted and go on to claim victory for humankind. Caro’s whole intent with the exhibition was to show that poker was a game worthy of serious analysis, like chess or bridge. The cards were bar-coded so Orac could read them, and as a result, the television audience was able to watch the game knowing what the players were holding or folding. Additionally, with this information, Caro was able to show on-screen statistics and probabilities, so viewers could better understand what was at stake with each play. 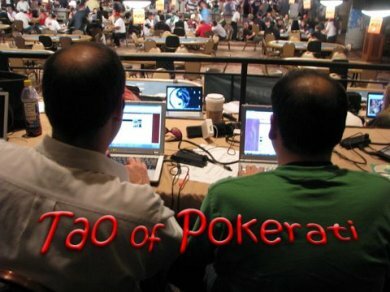 Now, 20 years later–thanks in no small part to a confluence of computers, television, and big-money Texas hold’em–poker is suddenly huge. Five different networks now carry the game on TV, with more poker shows in the making. Casinos across the country have been expanding their poker rooms, and at this year’s World Series of Poker, the tournament director had to truck in 100 extra tables to accommodate a record number of buy-ins. Online (a concept hardly conceived when Orac was the only machine that knew how to play) poker rooms seem to be opening up by the dozen, with real-money players signing up by the tens of thousands.